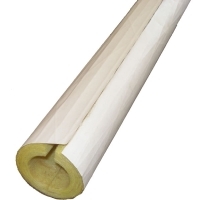 This is a sleeve of pre-slit rigid fiberglass pipe insulation with a self-sealing adhesive tab. The insulation has a reinforced foil and paper exterior wrap. This insulation is suitable for use on steam and forced hot water heating systems and water heater pipes 1" in diameter. The wall thickness is 0.5".